AZGS geologists Dr. Phil Pearthree and Dr. Ann Youberg will lead the Arizona Geological Society Fall Field Trip - "Debris Flows Shape the Sabino Canyon Landscape - look out below!" Route: We will catch the 9:00 A.M tram and take it to Rattlesnake Wash. Here and elsewhere along the tram road, we will examine debris flow deposits that formed in 2006. The final stops will be at the top or northeast end of the tram road, elevation approximately 3,200 feet. We return to the Sabino Canyon Visitor Center via the tram or down the Telephone Line Trail, about a 3-mile walk. The field trip will end around 12:30 PM. Conditions & Recommendations: All attendees should wear appropriate footwear for moderate hiking, which will be mostly along the tram road. Long pant and long-sleeve shirts are recommended for protection from the sun and vegetation. Be sure to bring your own snacks and water, as none will be provided by the AGS. 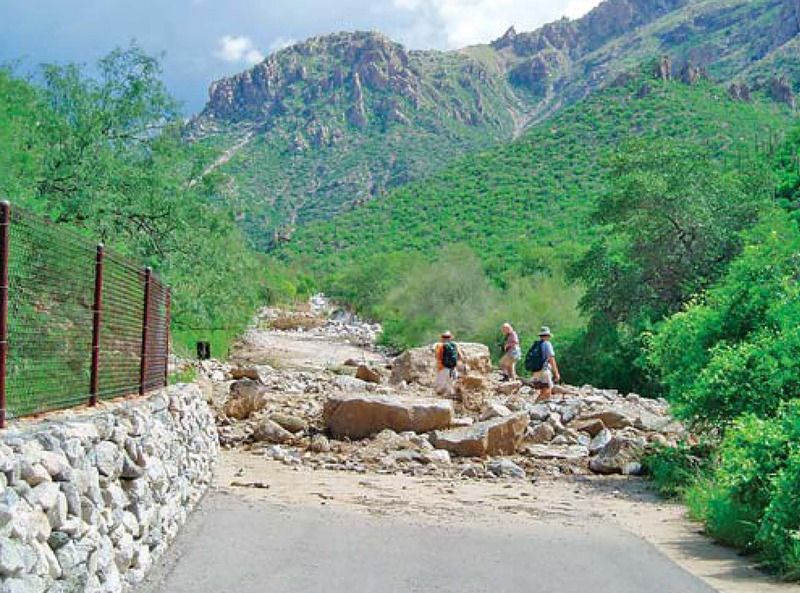 More information and online registration: Fall Field Trip - Debris Flows Shape the Sabino Canyon Landscape - look out below! Earth and Space Exploration day is a free annual fall event hosted by the School of Earth and Space Exploration (SESE) on ASU’s Tempe campus inside/outside ISTB 4. 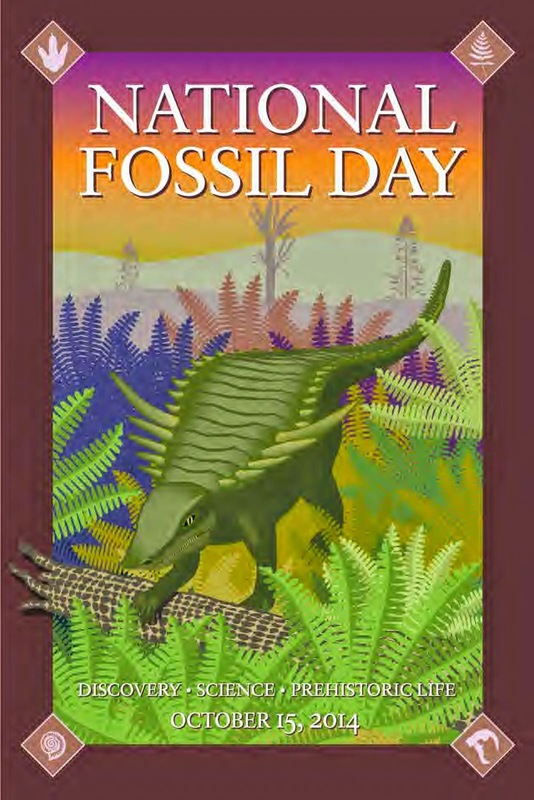 The SESE community offers special science-related activities from 9 a.m. - 3 p.m. for students age five and up, families, educators and anyone interested in exploring Earth and space. One of the biggest attractions is ISTB 4 with its Gallery of Scientific Exploration offering a variety of interactive exhibits and the Marston Exploration Theater, which will be running 3-D astronomy shows. Visitors can also see a replica of Curiosity Mars rover, explore "A" Mountain (Tempe Butte) on a guided field trip, bring rock samples for Dr. Rock to examine, and so much more! SESE’s research portfolio includes projects on every continent of the world, and extends to the Moon, Mars, Mercury, and beyond. We are taking photos of the lunar surface with special cameras, sampling the Red Planet using robotic rovers, studying earthquakes big and small, investigating mud volcanoes in Indonesia and much, much more! Each year, the SESE community brings to life its research through innovative hands-on activities as part of this special Earth and Space Exploration Day. Attending Earth & Space Exploration Day 2014 is free (including parking). But you can help us anticipate the number of people that will attend by pre-registering at http://eseday.asu.edu. Pre-registration also allows a speedy check-in for you and your family. The Marston Exploration Theater will be offering 3-D astronomy shows. The Center for Meteorite Studies features interactive displays, touchable specimens, and a video display of the collection’s specimens. Staff will be on hand to inspect potential meteorite specimens in person. Only one sample will be identified per person. The Lunar Reconnaissance Orbiter Camera (LROC) Science Operations Center, located in Interdisciplinary A, will be open. Visit the Moon rock and enjoy a guided walk through of the Visitors Gallery. Thursday is ShakeOut Thursday. At 10:16 am on 10/16, 120,000 Arizonans and 24 million people worldwide will “Drop, cover and hold on” to practice responding to earthquakes. The organizers remind us that everyone, everywhere, should know how to protect themselves in an earthquake. Even if earthquakes are rare where you live, they may happen where you or your family travel. The Arizona State Fossil, petrified wood, is among a long list of state symbols shown on the Arizona Secretary of State's website. 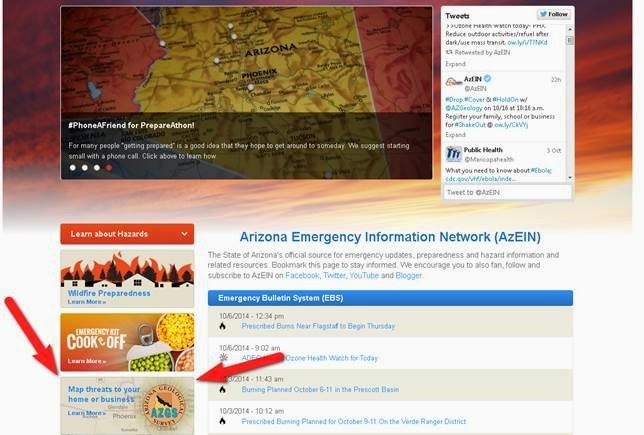 The AZGS online hazards viewer is now linked in throught the Arizona Emergency Information Network - https://ein.az.gov/. The viewer currently inlcudes information on earth fissures, active faults, earthquake epicenters, flood potential, and wildfire risk.